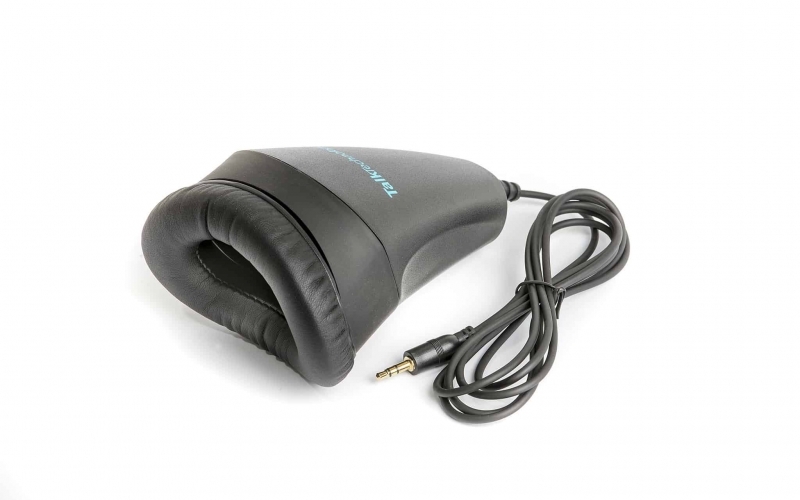 Stenomask is a hand-held microphone built into a padded, sound-proof enclosure that fits over the speaker’s mouth. The purpose of a Stenomask is to allow a person to speak without being heard by other people, and to keep background noise away from the microphone. 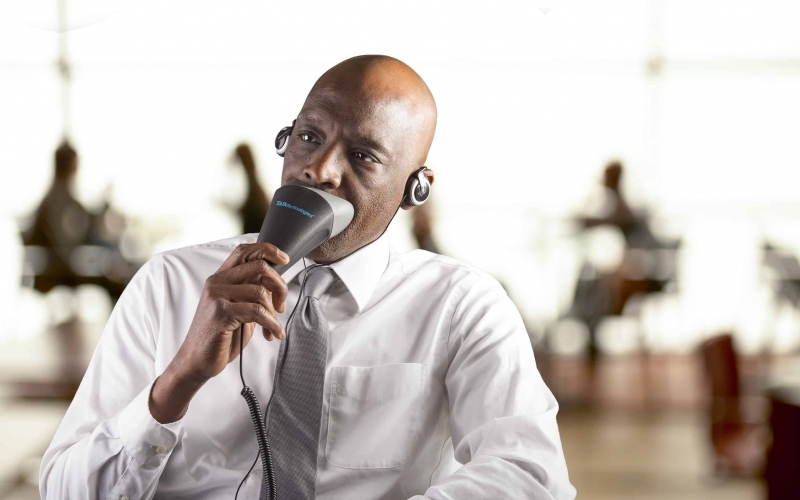 Are you looking for a microphone that provides total voice privacy and noise cancellation at the office, in public or at home? Talk Technologies is the leading authority on Stenomask, we invented it over 70 years a go. 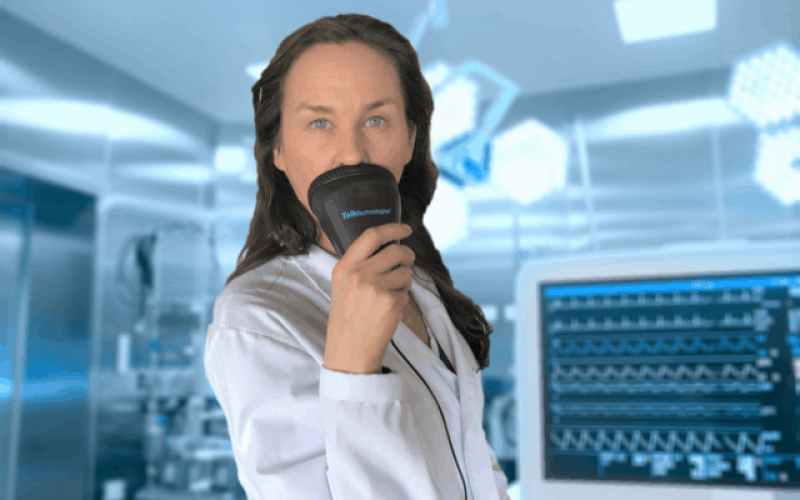 Steno SR (SR signifies speech recognition) is our sixth generation Stenomask microphone, its applications are more relevant today than ever before. Steno SR works precisely the same way as the world’s premiere sound booths except in pocket-sized form, guaranteeing absolute voice privacy and a crystal-clear sound signal while simultaneously eliminating all background noise. The ergonomic design allows you to hold it comfortably in either hand or, if you prefer, use the hands free option. Our Quiet Cushion face-piece provides incredible comfort and sound proofing. A breathing port inside the mask allows you to speak and breath naturally. Stenomask is the quintessential microphone when privacy and discretion are called for as well as in noisy or crowded environments. It can be used with any type of device including, phones, tablets, computers, recorders, transmitters, two way radios and amplifiers. Wherever there is a microphone input, you can use a Stenomask. The highest accuracy speech recognition results Speech recognition presents different challenges. In an office or public space for example, there can be multiple sound sources: people talking, equipment, TV and independent music/radio sources, interior and exterior noise. Isolating the source of a command, cancelling echoes and background noise requires sophisticated technology. 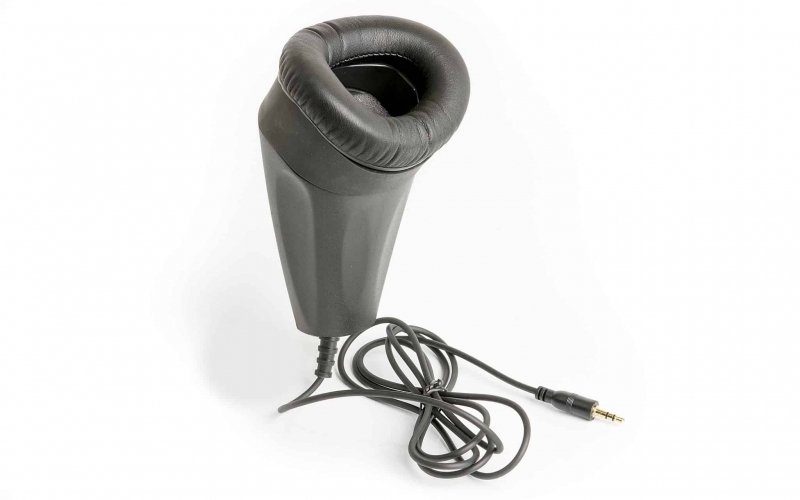 Steno SR is the worlds only speech recognition microphone that provides complete privacy and noise cancellation. When used in conjunction with speech recognition software such as Dragon, it allows you to achieve up to 100% text accuracy in real-time by eliminating all background noise. Going from your voice to your text document has never been more accurate or private. Voice security and privacy are more important and harder to find than ever. For this reason we invested over three years of research and development to create the Steno SR series. It provides total voice privacy and the best noise cancellation properties of any microphone device available on the market today. Healthcare – Many clinicians use voice technology for clinical decision support and documentation in their office or home, however they are much less inclined to do so in the presence of patients and peers due to privacy issues (HIPAA) and background noise affecting accuracy. Law enforcement – As the demands for quality, timely and increasingly standardized police incident reporting continue to rise, cumbersome reporting processes can impact productivity, efficiency and officer safety in ever increasing loud and crowded public spaces. Our proprietary voice isolating, micro sound booth technology ensures a safer and more accurate way to create incident reports and perform other essential tasks—all by voice. Military- Security – Verbally transmitting sensitive information without fear or consequence of being overheard by someone or listened in on by surveillance equipment. Eliminating all background noise in situation such as an aircraft carrier, battlefield, parade, concert etc. Legal – lawyers and or court interpreters that need to relay or document sensitive information via voice. Assistive technology – Individuals with disabilities that use speech recognition technology at work, home and school. Recently we have seen a dramatic increase in people embracing this technology at work and in the classroom. Used in conjunction with speech recognition software it affords them the ability to work freely, anywhere, without having to worry about disturbing others or being overheard. Court reporters – the demand for court reporters across the country is skyrocketing. Projections indicate that the shortage represents nearly 5,500 qualified reporters. An individual can become a certified (Stenomask) verbatim court reporter in as little as 6 months. Stenomask is used in every military courtroom in the USA. Commuters, open office workers – Privately transcribing emails or documents on a train, bus or airplane without disturbing others or making confidential phone calls and voice notes. Language interpreters – Stenomask used with a transmitter enables clear, noise free voice transmissions when information needs to be provided in one or more language to large or dispersed groups. These vertical markets include meetings, tour groups, churches, businesses, hospitals, schools, military, law enforcement etc. Keep voice communications and transcriptions completely private and silent while simultaneously increasing productivity and well being.